Royal Recovery: Remains ID'd As Those Of King Richard III : The Two-Way A skeleton discovered under what's now a parking lot in the English city of Leicester is that of the warrior king, researchers say. They identified him by matching DNA to that of a distant relative who's alive today. 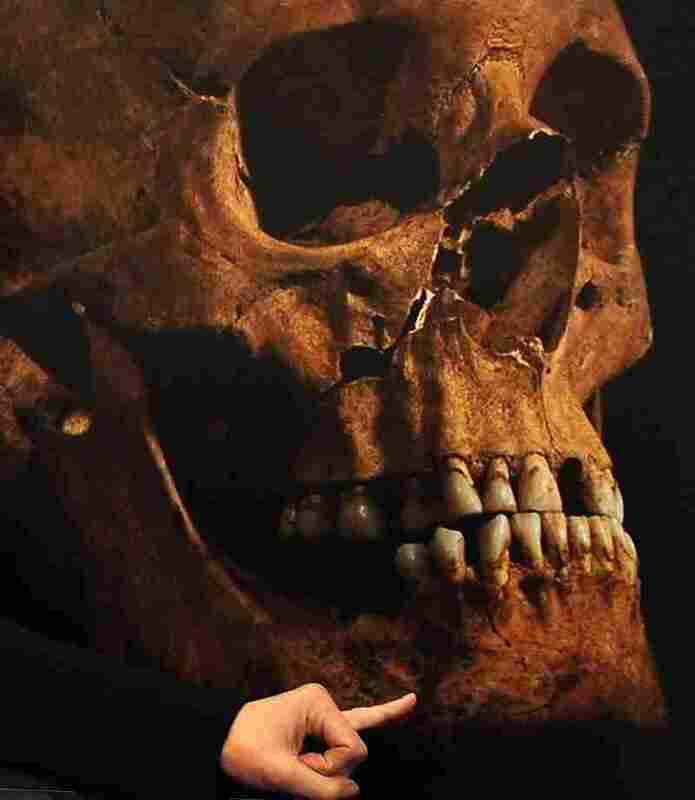 Remains found under what's now a parking lot in the English city of Leicester have been confirmed to be those of King Richard III, researchers at the University of Leicester announced Monday. NPR's Philip Reeves tells our Newscast Desk that the skeleton of the ruler immortalized by William Shakespeare was identified thanks to a DNA match with a distant relative. The 15th century warrior king, as All Things Considered reminded us last September when word emerged that his long-lost remains may have been recovered, was killed at the Battle of Bosworth. He was about 32 at the time. According to Philip, the site where Richard III was buried used to include a church. The distant relative who provided the DNA to match with the king's, says The Guardian, is Canadian Michael Ibsen. According to the Guardian, the king's remains "will be reinterred in Leicester Cathedral, probably early next year." Historian Helen Castor tells the Guardian that the discovery means "we now have some facts with which to calibrate our reading of both contemporary evidence and Tudor propaganda about Richard's appearance, and the accounts of his death at Bosworth." The University of Leicester researchers have posted a great of information about the science behind their discovery and the king. Richard was thought in his time and decades after to be a dark, deformed man — "rather like a spider" — who murdered his way to the throne and then killed two of his nephews, historian John Ashdown-Hill, an adviser on the search team, told NPR's Audie Cornish on Monday. But don't blame Shakespeare for spreading that portrait, Ashdown-Hill said. Shakespeare, he said, was "working from the material he had available," which was largely "propaganda" from the Tudor dynasty. More from Audie's conversation with Ashdown-Hill is due on today's All Things Considered. Click here to find an NPR station that broadcasts or streams the show. There's also going to be a report from Phil Reeves. Update at 9:55 a.m. ET. More About Richard And How He Died. "History, they say, is written by the victors. Tudor writers and artists had no qualms about depicting Richard III as an evil tyrant and child-murderer, as well as a crippled hunchback. Shakespeare's eponymous play, written 106 years after Richard's death, cemented the King's bad reputation (and appearance) among the general public for centuries." "In 1924 the Richard III Society was founded, aiming to challenge accepted beliefs and assumptions. ... Among the inarguably good works of this popular King, they pointed out, were a number of significant changes to English law, including the presumption of 'innocent until proven guilty' and a reformation of the jury system." "Richard III was portrayed as deformed by some Tudor historians and indeed the skeleton's spine is badly curved, a condition known as scoliosis. However, there was no trace of a withered arm or other abnormalities seen in the more extreme characterizations of the king." As for how the king died, the university researchers say they were 10 wounds on the skeleton and that Richard was "killed by trauma to the back of the head." There's also evidence that his body was "subjected to 'humiliation injuries' — including a sword through the right buttock."